By James Channing Shaw, M.D. Trust in doctors. It used to be absolute. If our sick patients improved, we were celebrated. When we failed, families praised us for trying. 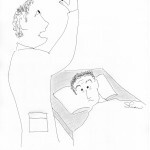 This arrangement was not right, but no doctor went to any great lengths to change the perception. About three decades ago, the pendulum swung. Now doctoring is frequently viewed as market share, self-promotion, unnecessary procedures and testing. It would seem that professionalism has become obsolete. Patients, too, have changed with the times. Many patients would like to have every test, expect their health problems to be cured, fixed painlessly, no disruption to social calendars, easy parking, and why can’t this cancer be cured when man could land on the moon back in 1969? Greedy doctors and entitled patients. Can anything be done to reduce the smoldering hostility? Yes, but not without considerable effort on both sides. We doctors don’t usually become more humble during our training. Quite the opposite, we can become more arrogant as we rise in stature and gain self-confidence. Those without an innate sense of professionalism and the altruistic dedication that goes with it will have to be taught how to deal with patients conscientiously, free of arrogance, greed, and conflicts of interest. More importantly, these skills will need to be evaluated throughout a doctor’s career. Fortunately, medical schools and credentialing boards have started to recognize this and are developing methods for teaching and evaluating such competencies. In the patient arena, the sad truth remains that there are no guarantees. Human cell biology is considerably more complex than rocket science. A single DNA mutation during embryonic development causes a debilitating, life-long disease. A three-year-old child develops brain cancer or leukemia. These unfortunate individuals and their doctors have little control over the causes or outcomes. We should be thankful for what discoveries have been made over the years, and should expect that our own doctor’s training and continued medical education reflects that learning. As for the high expectations of patients, I suspect they will continue. New drugs and diagnostics get marketed aggressively. Hopeful patients clamor to get the latest scan or drug they saw advertised on U.S. television. Most patients don’t understand the risk of harm that comes from unnecessary testing and treatment. If patients were to routinely receive balanced pros and cons of treatments and tests, they might develop more reasonable expectations. Corporate entities and pharmaceutical companies certainly will not be providing that balance. We doctors must do it. Some progress is being made, however: Choosing Wisely®, Choosing Wisely Canada® and the Conference on Preventing Overdiagnosis are addressing the harm that can come from too much medicine. A true patient-doctor partnership? For doctors, that would mean caring for the whole patient, examining best evidence before making recommendations for testing and treatment, and placing patient care above financial gain. For patients, it would mean recognizing that uncertainty always exists and that more medicine is not always better medicine. Finally, we all need to understand that medical decisions must ultimately include not only the wishes of individual patients and their doctors, but consideration of societal and public health priorities as well. For PDF: Can Doctors and Patients Be Partners in Healthcare? This entry was posted in James Channing Shaw and tagged Choosling Wisely, doctor-patient communication, doctor-patient partnership, doctor-patient relationship, medical professionalism, psycian conflict of interest by humanemedicine. Bookmark the permalink.